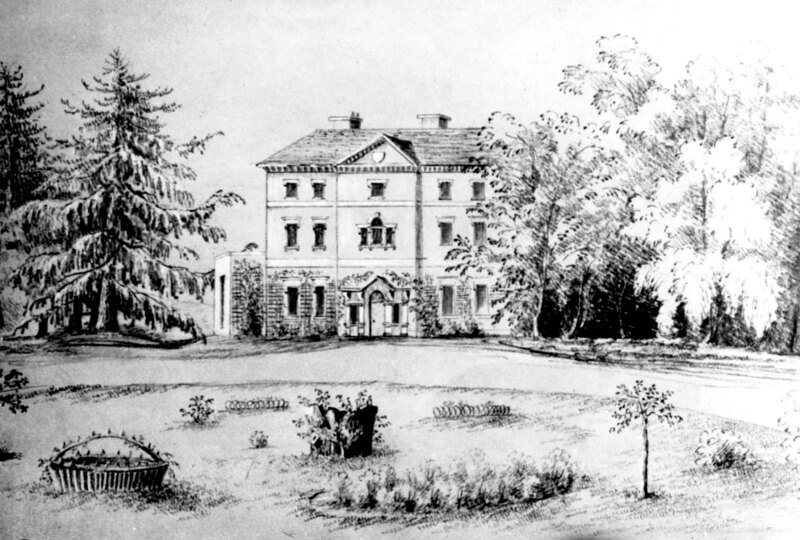 The first Home of the newly weds John-Lewis Moilliet and Amelia Keir. 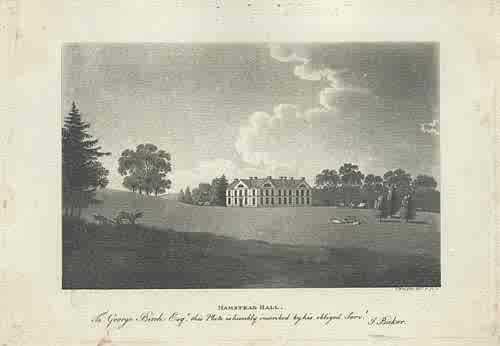 Jean Louis Moilliet moved his family to Hamstead Hall in Handsworth in 1826 and the Smethwick Grove was let to George Bacchus. In the year of Queen Victoria's accession - the property was bought by John Lewis Moilliet from the surviving family of Col. Henry Bromley, who were half cousins of his daughter-in-law Lucy Galton. He rebuilt the manor (then called Abberley Lodge) in the Italian style but died on January 6, 1845 just as it was being completed. On Christmas Day, 1845 the house was severely damaged by fire, as reported in the Birmingham paper. His widow Amelia rebuilt the house and lived there until 1861. Following Amelia's death Abberley Hall was rented out most of the time with only short occasions where, between renters, members of the family resided there. The last large family get-together in the Hall was for the wedding of Emma Sophia, James youngest child by Lucy Galton, to William Bent in 1866. It was sold in 1867 to John Joseph Jones for £ 86,500. 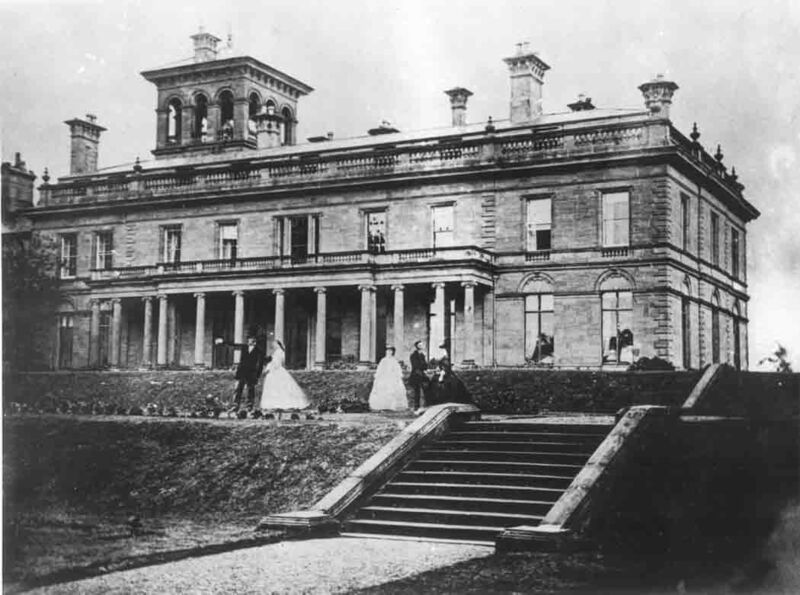 Abberley Hall at the time it was purchased from the Bromley family. The sketch appeared in the Illustrated London News. 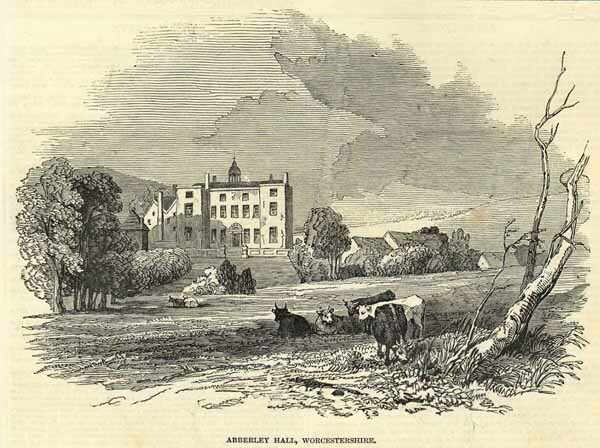 Abberley at the time Jean Louis son James occuppied the estate. Pictured is James with oldest daughter Lucy Amelia and second daughter Frances Anne Adele with Lucy's husband Rev. Geo. Hesketh Biggs and James second wife Jeanne Sayous. 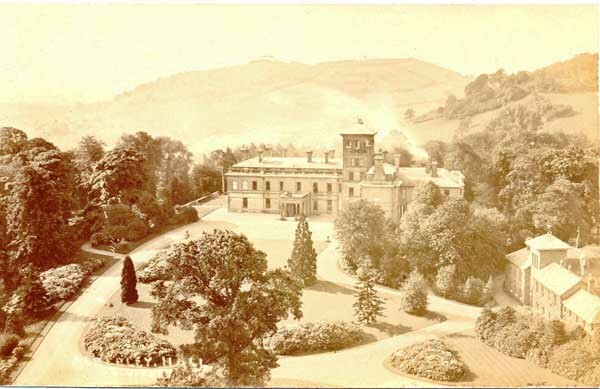 Abberley Hall from an early photograph showing the gardens in front of the home. Many of the ancilliary builtings to the right still exist. The picture was taken before the tower was reduced in height. Close to the school is a "folly", the subject of a children's book by Gene Kemp. John-Lewis Moilliet purchased the "Chateau de L'Imperatrice" at Prêgny, located with a view of Lake Geneve, sometime in the 1830s. Here he and Amelia entertained numerous guests from Geneva society and also many traveling friends from England. One who often visited was writer Maria Edgeworth. Other prominent visitors were Sismonde the historian, Pictet the chemist and Dr. and Mrs. Marcet, she being the author of "Conversations on Chemistry". The chateau previously belonged to the Empress Josephine, Napoleon's first wife. It is not known if she ever resided there. However in Emma Sophia's recollections of her childhood visits to Prêgny she claims to have occasionally visited a farmer who said he had met Josephine there while delivering local produce. 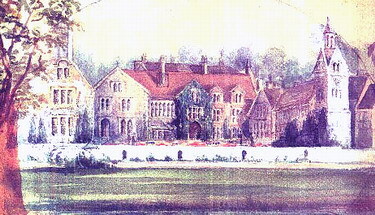 The Elms was purchased by James Moilliet in 1849, while Abberley Hall was being restored from the disasterous fire in 1845. 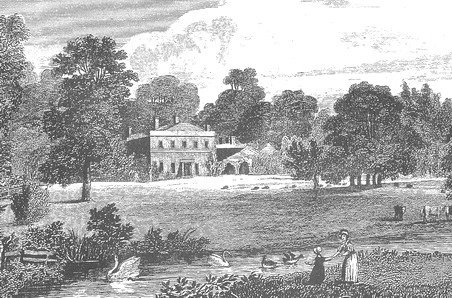 James and his family lived at The Elms until 1853 when he bought Harborne Lodge, a large house nearer Birmingham. His daughter Frances Anna Adele (Delly) and her husband Rev. Cameron Galton then lived in The Elms. This imposing Queen Anne Mansion was built in 1710 by Gilbert White, an understudy of Sir Christopher Wren. Today The Elms is a luxury hotel. The house was enlarged, by adding wings on both sides. It is not know if James added them or whether they were added much later. Purchased in 1824 this was another property that was part of Jean Louis' estate when he died in 1845. His son Theodore raised his family here. This is another home imhabited by Theodore Moilliet and his family. 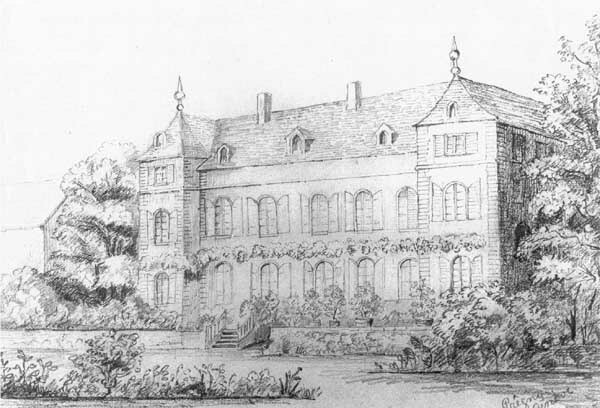 It is unknown if this estate was also part of Jean Louis' holdings. It has a bit of a colourful history. 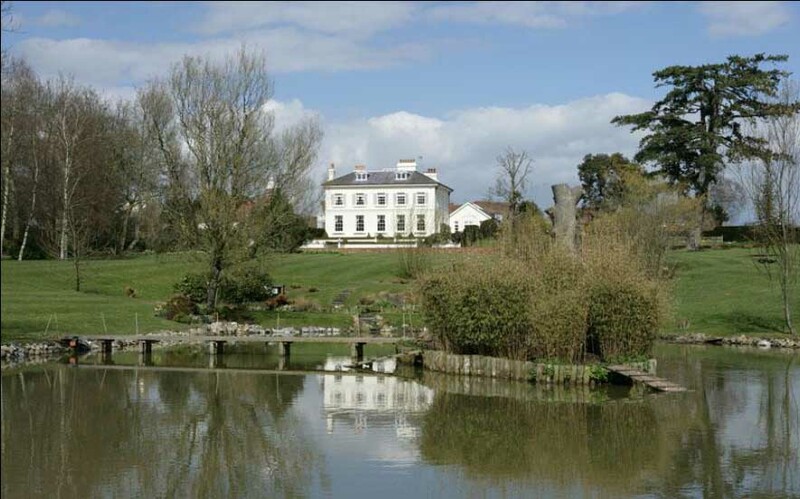 Ellerslie House at Gill's Green, near Cranbrook, is said to have been built from the profits of smuggling during the reign of the 'Hawkhurst Gang', whose leader, James Stanford, alias Tripp, amassed a huge fortune and was eventually convicted of murdering a customs officer in 1740. The immaculate three-storey Georgian house has six reception rooms, eight bedrooms and four bath/shower rooms and stands in 10 acres of landscaped gardens and grounds. In the fall - winter of 2006 this estate could be purchesed for £2.65m. Cheney Court had been a small monastery, and later a mansion with Tudor additions, dating from the fourteenth century. It was purchased by James Molliet in 1866 and passed to his son James Keir (1836 - 1906) upon the senior James death in 1878. It was said to be large enough to put up 20 guests. 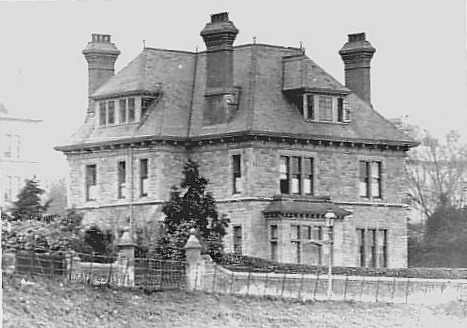 James Keir moved his family to Abbotsleigh in Malvern in 1886 where there were better education opportunities for his children. He let the house to a Mr. Alfred Monson who used the mansion to house a private preparatory school. Unfortunately a mysterious fire destroyed the structure on July 27th, 1888. A newspaper account of the fire makes specific note, "The furniture was of a valuable description. The mahogany billiard table was consumed before the oaken floor appeared to be affected by the fire. Hardly any sign of it (the furniture) remains". It also seems there were some valuable oil paintings lost, one of which was a view of Lake Geneva, which narrowly escaped destruction in the fire at Abberley Hall at Christmas 1845. The house contained a room of considerable interest called "The Sibyls Room". This had a Jacobean chimneypiece with paired columns above and below and, above the oak panelling, insert paintings representing 13 sibyls and 18 prophets. This was the third incident of fire at the mansion in 2 years and apparently Mr. Monson had at least one similar experience in another rented mansion a few years later. He also faced murder charges as a result of a drowning in a Scottish Loch. What remains today is the chapel of the house - now used as a barn. 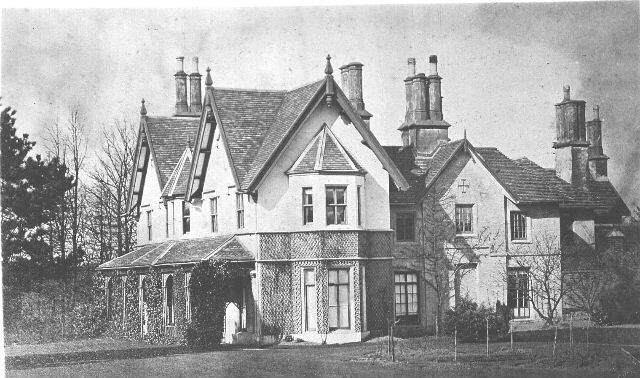 Abbotsleigh was the home in Malvern where James Keir Moilliet brought his family after leaving Cheney Court. The family was also involved in the churches in the area.